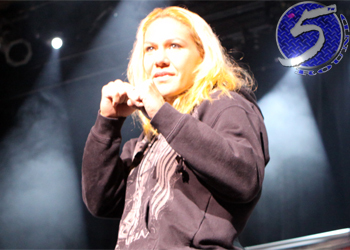 And here we thought Cristiane “Cyborg” Santos (Pictured) didn’t know English. In response to UFC president Dana White’s statement that the former Strikeforce featherweight champion wants no part of freshly-minted UFC bantamweight queen Ronda Rousey, Cyborg took to Twitter Wednesday and shot down White’s claims while issuing a unique challenge to Rousey in the process. “I am not afraid of Rhonda!” Cyborg posted. “I will fight her anywhere and anytime for free – everyone knows I barely make 145- but I am willing to sacrifice and meet her half way at 140- I can’t believe dana says I want nothing to do with Rhonda- what he wants me to do is fight Rhonda with both my hands tied behind my back or comatosed – so that she can have a chance-which is what making me fight at 135 is. White has stated countless times the UFC will only offer the women’s bantamweight class. Cyborg and her doctors have professed she is physically unable to shed the 10 additional pounds required to drop to Rousey’s 135-pound division. Rousey makes her big league debut at UFC 157 against Liz Carmouche. Cyborg’s year-long steroid suspension expired on December 17th. No word if the 27-year-old has tried to reapply for licensing.